What is on the five-year horizon for higher education institutions? Which trends and technology developments ll drive educational change? What are the challenges that we consider as solvable or difficult to overcome, and how can we strategize effective solutions? These questions and similar inquiries regarding technology adoption and educational change steered the collaborative research and discussions of a body of 58 experts to produce the NMC Horizon Report: 2016 Higher Education Edition. This NMC Horizon Report series charts the five-year horizon for the impact of emerging technologies in colleges and universities across the globe. With more than 14 years of research and publications, it can be regarded as the world’s longest-running exploration of emerging technology trends and uptake in education. 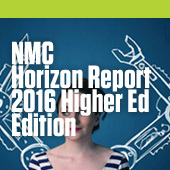 The NMC Horizon Report > 2016 Higher Education Edition is a collaborative effort between the NMC and the EDUCAUSE Learning Initiative (ELI). This 13th edition describes annual findings from the NMC Horizon Project, an ongoing research project designed to identify and describe emerging technologies likely to have an impact on learning, teaching, and creative inquiry in education. Six key trends, six significant challenges, and six important developments in educational technology are placed directly in the context of their likely impact on the core missions of universities and colleges, and detailed in succinct, non-technical, and unbiased presentations. Each has been tied to essential questions of relevance, policy, leadership, and practice. The three key sections of this report constitute a reference and straightforward technology-planning guide for educators, higher education leaders, administrators, policymakers, and technologists. This research will help to inform the choices that institutions are making about technology to improve, support, or extend teaching, learning, and creative inquiry in higher education across the globe. All of the topics were selected by an expert panel that represented a range of backgrounds and perspectives. View the work that produced the report on the official project wiki.